(Vancouver, BC): Laneway homes were first legalized by the City of Vancouver in 2009. 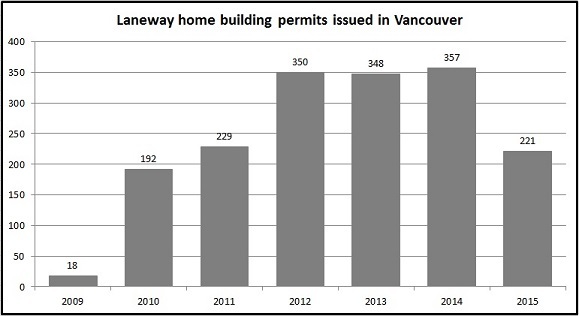 As illustrated in the chart below, more than 1,100 laneway home building permits were issued in the past six years. The Planning Department indicates that another 221 building permits were issued in the first half of 2015. Guaranteed building replacement cost coverage: Assuming policy conditions are met, the full cost to rebuild the home will be covered even if that cost exceeds the coverage limit.